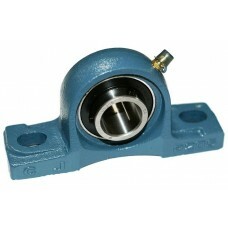 Bearing Depot & Supply has a large stock of pillow block mounted bearings. These industrial bearing units mount with two bolts (not included) for many applications in Industrial and Scientific purposes. The inserts come along with the pillow block and are in metric (mm) and inch dimensions. The housings are commonly made of cast iron with pressed steel bearings and bearing balls. Housings are also available in Stainless and Thermo-plastic. Pillowblock , 1-9/16 bore UCP208-25..
UCP209-26 1-5/8 BORE. Pillowblock ..
1-11/16 Pillowblock , Cast Iron. ..
Pillowblock bearing 1-7/8 bore. ..
Pillowblock 2'' bore. Also available UCP211-32 which is a larger block. .. Larger block 2'' bore pillowblock. ..
2-1/8 Bore Pillowblock bearing ..